STONECUTTERS ISLAND in Hong Kong used to be a favoured habitat for poisonous snakes and eye-catching birds such as the white-bellied sea eagle. Thanks to Hong Kong’s rapid development, it is no longer so hospitable. Its sky is full of gantry cranes, stacking 20-foot-long shipping containers in multicoloured tessellations, like giant Lego bricks. A cluster of decorative containers, daubed in graffiti, line the perimeter of container terminal eight, which is partly operated by COSCO, a state-owned Chinese shipping giant. In bright yellow lettering, one slogan instructs passers-by to “Respect Past, Embrace Future”. 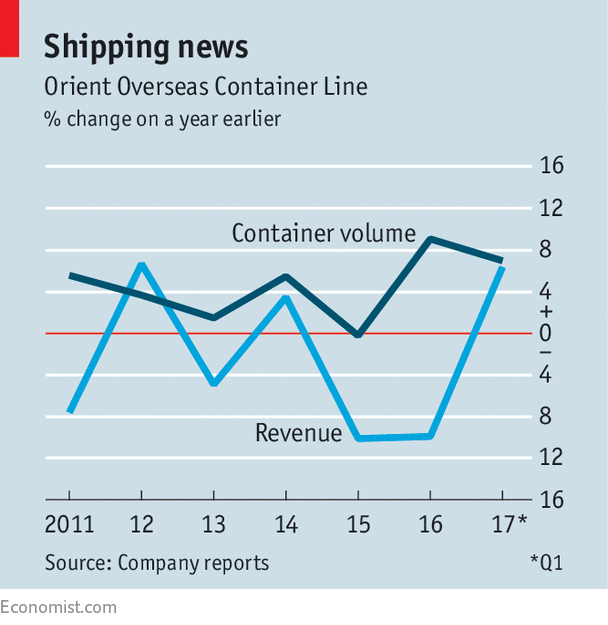 Few Hong Kong companies have as much to tell about the past as Orient Overseas Container Line (OOCL), the world’s seventh-biggest container shipping line. Its founder, Tung Chao-yung, owned the first Chinese-crewed steamship to travel from Shanghai to France in 1947, and went on to build a shipping empire of over 150 vessels. His eldest son and successor, Tung Chee-hwa, survived the financial strains of the early 1980s (with the help of Chinese money) and became Hong Kong’s first leader after it was handed back to China in 1997. The future, however, looks uninviting. The world’s shipping fleet, replenished by ever bigger vessels, has grown faster than the globalisation it serves. Reckless expansion by some firms, in an industry which overvalues market share, has hurt more prudent competitors. This has pushed OOCL into the arms of COSCO. 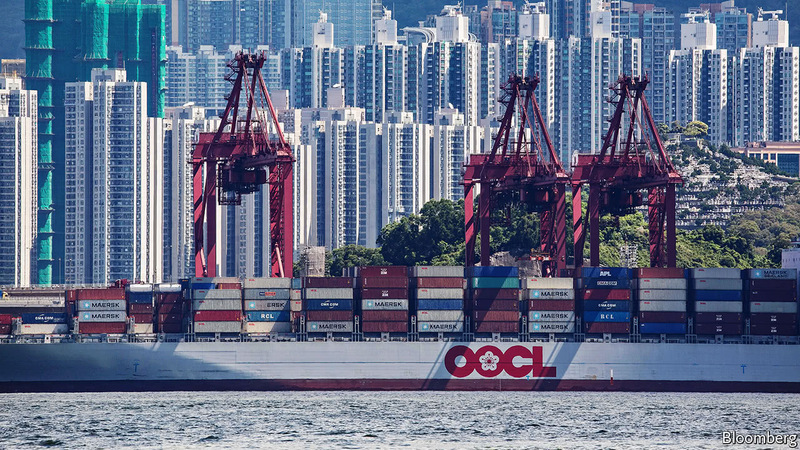 On July 9th OOCL’S owners announced its sale to COSCO for $6.3bn, pushing their Chinese rival from fourth into third place among the world’s container-shipping lines. If the merger is approved by antitrust regulators in America and Europe, it will be the latest of a string of big consolidations, including Maersk’s acquisition of Hamburg Süd, a proposed tie-up among Japan’s three biggest carriers, and COSCO’s earlier merger with China Shipping Container Lines. The industry may be the handmaiden of globalisation but it is congealing into regional oligopolies. When the dust settles in 2021, by when the current crop of deals will be concluded and ships under construction delivered, the top seven firms will control roughly three-quarters of all container ships, according to Drewry Maritime Financial Research, compared with 37% in 2005. Consolidation should allow the two firms to remove any unprofitable overlap in their routes and operations. But COSCO’s cost-saving plans do not include cutting people or pay, at least for two years, it has promised. OOCL’s value to COSCO lies in its management talent as well as its tonnage: it is run more efficiently than many rivals. OOCL is also well attuned to global ways of doing things, as befits a company that carries more containers across the Pacific than within Asia. It now refuses to ship whales, sharks and dolphins, and has won plaudits for reducing emissions through the use of battery power in its redevelopment of the Port of Long Beach in Los Angeles. COSCO’s offer price of HK$78.67 ($10.07) per share certainly seems full of respect, valuing OOCL at 40% above its book value. The premium partly reflects a nascent revival in OOCL’s fortunes: revenues increased by 6.4% in the first quarter compared with a year earlier (see chart). The industry is recovering. Thanks to the demolition of many smaller ships, the global container fleet grew more slowly than traffic last year for the first time since 2011, says BIMCO, a shipping association. But OOCL’s chairman, Tung Chee-chen (the founder’s second son), believes the recovery is vulnerable to a variety of dangers, including potential trade frictions and the remaining “supply overhang”. Shipping firms placed few orders for new vessels in 2016, but many older orders have yet to be delivered. More new capacity will be added this year than last, according to BIMCO. Those ships were requested in expectation of a rosy global economy that never arrived. The future would be easier to embrace if it were not so hard to grasp. Ngai Tahu’s legal representation has demanded Lyttelton Port of Christchurch (LPC) commit to a NZ$1m bond to ensure it improves the environment, if consented to deepen its shipping channel from the current low-tide of 12-12.5 metres to about 17-18 metres. The tribe made the call during a recent hearing before Environment Canterbury on the grounds that traditional harbour food gathering resources were already being impacted by sediment and could likely be further impacted by increased port dredgings. However, LPC counsel countered that the port had already shown an environmental commitment by moving the dispersal grounds further afield from the harbour and emphasised that there was actually no legal requirement to provide an environmental “gain”. Noting that over the past decade the size of global containerships has virtually doubled, LPC is seeking to deepen its channel in order to accommodate larger callers and not be demoted to feeder port status in the New Zealand shipping scene. Partnerships between iwi and government to develop a strong network of regional rail connections could generate thousands of jobs and billions of dollars, the Maori Party says. In coalition negotiations they’ll ask for $350 million to fund their new IwiRail policy which would look to take over mothballed KiwiRail lines and develop new rail connections to open up freight and tourism opportunities across regional New Zealand. Party president Tuku Morgan and co-leaders Te Ururoa Flavell and Marama Fox announced the plan in Wellington yesterday following informal discussions with the Government and talks with investors and iwi in Gisborne and around the country. It will focus on freight, passenger and tourism with the first project to be reconnecting the line through to Gisborne. 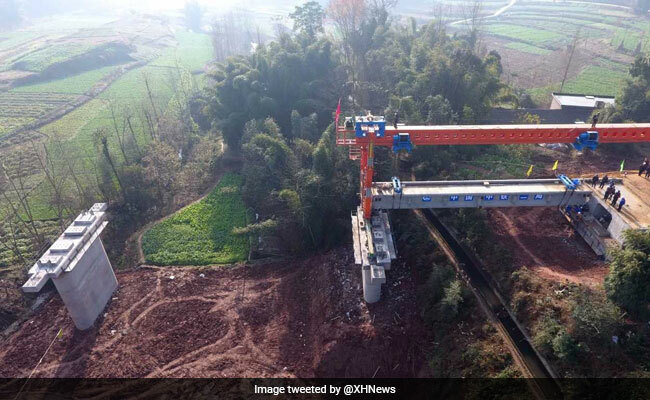 “That’s only going to cost about $6.5m to fix that break in the railway line but it will open up productivity,” Ms Fox said. The policy would allow iwi to invest in rail networks, but also create opportunities for other investors, creating profit by helping producers get their products to market. “And if we open up the top of the East Cape we open up an untapped tourism market,” she said. Mr Morgan said it could generate thousands of indirect jobs around the country as a result. Ms Fox said iwi in Nelson have expressed an interest in being part of an IwiRail programme down the track. The Taxpayers’ Union accused the Maori Party of “populist economic sabotage”. “Economically, this is worse than literally lighting a bonfire of taxpayers’ money,” spokesman Jordan Williams said. Intelligent transport: More talk, no action? Transport Minister Simon Bridges has announced plans for a study into how New Zealand’s economy can benefit from intelligent transport systems, without making any mention of the Government’s existing intelligent transport plan. On 18 June 2014 the Ministry of Transport released its Intelligent Transport Systems Technology Action Plan 2014-2018. It listed close to 50 specific actions that the Government was supposed to have undertaken by the end of 2015. It gives no indication of what the government has done to fulfil this “essential role”. The Ministry of Transport has partnered with BusinessNZ to commission the new study. It will be overseen by an advisory group chaired by Dr David Prentice, chief executive of the New Zealand arm of Opus, a NZX-listed global infrastructure development and management consultancy headquartered in New Zealand. He is also chairman of the New Zealand Business Infrastructure Committee. The group also includes the Ministry of Business, Innovation and Employment and a range of other players from the public and private sectors. Bridges said it was critical that the Government engaged with the private sector, which is developing much of the technology. “The study is expected to be completed by the end of 2017, and will make recommendations for how we can develop and grow ITS market opportunities where we have a competitive advantage, and identify areas to be strengthened,” Bridges said. “There are companies in New Zealand already working in the growing ITS market, as well as companies who could do so. A number of international companies have also expressed interest in developing their ITS technologies in New Zealand. “Leveraging off these advantages to support businesses, and attracting international companies to come and develop their technology here, will have significant benefits for transport in New Zealand, and the broader economy,” he said. A coalition of Pacific Island ministers has launched a joint call for the global shipping industry to cut greenhouse gas emissions. Ministers from the Marshall Islands, Tuvalu and Kiribati were joined by envoys from Fiji, Vanuatu and Palau in urging member states of the International Maritime Organisation to try and limit global warming to 1.5 degrees celsius above pre industrial levels. The Marshall Islands minister for transport Mike Halferty told the London meeting that the shipping industry was one of the world’s big emitters. Mr Halferty and Pacific states have submitted a proposal supported by France, Germany and Belgium for the shipping industry to meet a zero net emissions target by 2035. Two more sets of negotiations are planned ahead of an expected 2018 climate deal for the maritime sector. COSCO Shipping‘s and Hong Kong‘s Orient Overseas International‘s (OOIL) shares leapt on Monday after the Chinese shipping giant made a $6.3 billion offer for its smaller rival on Sunday. Analysts said the pricing of the deal, at a 31.1 percent premium to OOIL’s previous close, was high given the global container shipping industry is only just beginning to emerge from a prolonged slump and underlined COSCO’s global ambitions. OOIL shares on Monday rose over 20 percent on Monday morning, while COSCO’s Hong Kong-listed shares were up to their highest level in almost two years. Should the deal go through, COSCO Shipping will become the world’s third-largest container shipping line after Denmark’s Maersk Line and Switzerland’s Mediterranean Shipping Company (MSC). “This is an expensive acquisition to become the third largest global container line,” Jefferies analyst Andrew Lee said in a note. Beijing has been outspoken over its desire to strengthen its hold over global shipping, which dovetails with the country’s Belt and Road political initiative that aims to expand and exert control over supply chains from Asia to Europe. COSCO Shipping is a product of a state-driven merger between China Ocean Shipping (Group) Company and China Shipping Group, previously ranked sixth and seventh largest respectively in terms of the world’s largest container shipping fleets. The deal would see Beijing take a firmer grip of Hong Kong’s transport hub, even as the city’s once world-leading port loses ground to rival ports on the mainland.